Our recent study, , reveals that the line between business and leisure travel is becoming increasingly blurred as more and more business travelers extend trips to make the most of their time away from home, or the office. 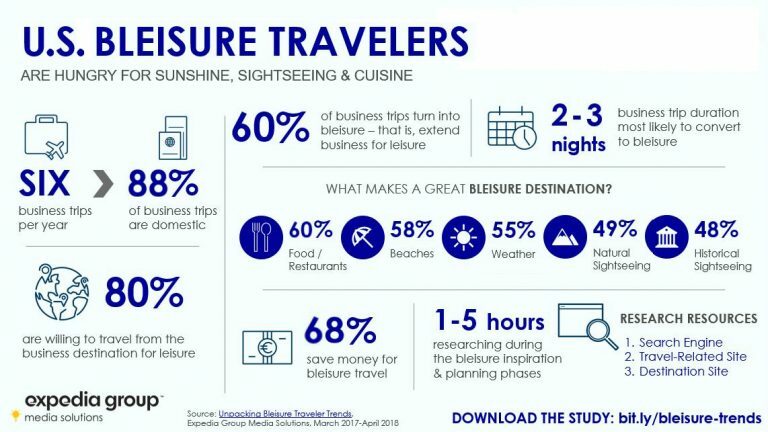 Our 2016 study, Profile of the American Bleisure Traveler, shed light on trends and behaviors of U.S. travelers who combine business and leisure travel. As the rise of global bleisure continues, we revisit some key findings to examine how this trend has developed over the past couple of years. - Bleisure is on the rise. In 2018, 60 percent of U.S. business trips featured an added leisure element, up from 43 percent in 2016. Leading factors that help these trips convert include traveling to a destination with great entertainment, visiting an iconic or bucket list destination, and the destination being easy-to-navigate. - Domestic locations still rule. Domestic trips account for almost 90 percent of U.S. business travel, so it’s unsurprising that cities like New York remain popular destinations for combining business and leisure travel. However, since 2016, several new cities have carved out reputations as being top destinations for these types of trips, including Phoenix, Boston, Orlando, and Houston. - Extending international business trips for leisure is on the rise. While U.S. travelers are far more likely to travel domestically, the growth of international bleisure trips has skyrocketed. In 2016, 52 percent of international business trips were extended for leisure. Fast forward to 2018, and this figure has risen to 80 percent. This article originally appeared in Skift.